Measurements: 2.73 x 4.72 inches, or 69 x 120 mm. Back of card: In the center, a brownish circle with a cream interior. There are swirls leading to it, above & below. Two rose blooms, on either end of a sinuous, thorn-laden cane, run from upper left to lower right. May be inverted, but does not contrast well with the front of the cards, as many of the same colors are used. Booklet included: Yes, 24 pages, 2.55 x 4 inches, or 65 x 112 mm. English only. Comments: The artist is Thai, born in Bangkok. She has lived in Ethiopia & New Zealand. Fenestra is Latin for windows, which are used as frames for the images on the minor arcanas. This deck is intended to be both beautiful and soothing. both traits of Thai culture. Many of the faces in the deck are striking. 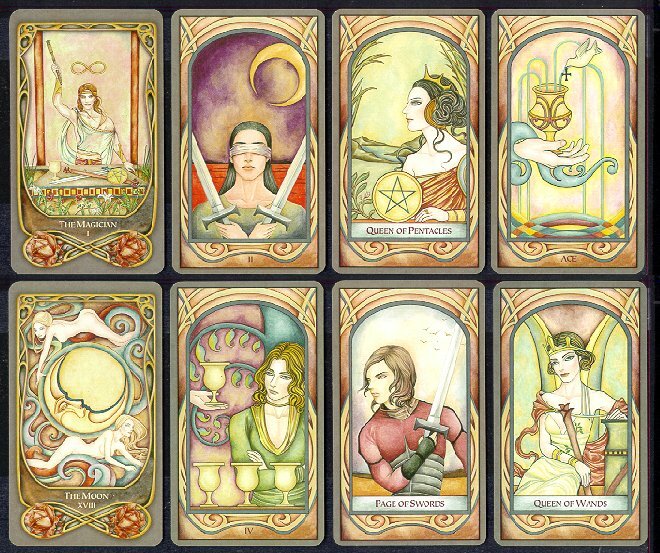 They remind me of David Palladini's classic Aquarian Tarot.